What would we do without our beloved Romanian pal Vlad the Revealer from Celebrity Address Aerial, y’all? It was he, after all, who demanded that we spill the proverbial jelly beans on a super-contemporary mini-mansion way up high in the Benedict Canyon region of the Beverly Hills Post Office neighborhood. For those of you ignorant young’uns, the B.H.P.O. refers to homes in the mountains above Beverly Hills. These properties carry a 90210 zip code but are technically located within the boundaries of the city of Los Angeles — which means they are saddled with LA city utilities and public services. You know the drill. Anywho, this September (2016) the aforementioned contemporary crib sold for a hefty $7,750,000 to an enigmatic blind trust that purposely shields the identity of the buyer. Mr. Revealer, however, wasn’t about to accept that and insisted that Yolanda snitch about who the top-secret new owner is. And who are we to leave great Mr. Revealer’s wishes unfulfilled, right? The new owners, as Yolanda soon discovered, are a fella from Mexico named Eugenio Gonzalez Derbezand his wife Alessandra Rosaldo. Our Ms. Rosaldo is an actress/singer/dancer who has portrayed a bunch of roles on various Mexican soap operas. She is also known for her singing career, both solo and with her successful band Sentidos Opuestos. And she’s got more than a million followers on that Instweird thingamajiggy. Eugenio Derbez is an actor/comedian/director/producer who has been a familiar face on Spanish-language TV since the 1980s, starring in Mexican soap operas such as Anabel and Papá soltero. In recent years, he has also begun appearing in klassy Hollywood films such as Beverly Hills Chihuahua, Jack and Jill, and Miracles from Heaven. The real reason Mr. Derbez is able to afford a $7.75 million house in the 90210, however, is because he created, directed, and produced the highly-successful XHDRbZ and La familia P. Luche sitcomes, which went into (highly-lucrative) syndication with both the Televisa and Univision giant networks. In recognition of his success, Mr. Derbez received a star on the Hollywood Walk of Fame earlier this year (2016). But we digress. Yolanda carefully perused property records and from what we can tell, the subject property was purchased by a real estate developer named Alan M. Shafer three years ago for just $1,750,000. The industrious Mr. Shafer quickly tore down the existing 3,000-square-foot house and replaced it with a big-but-not-oppressively-huge 5,343-square-feet of architectural pizazz. The somewhat-ominous-looking front facade lacks any street-facing windows on the first floor, assuring celeb-style privacy. A two-tone paint job (or three-tone if y’all count the black garage door) keeps things fresh and different from all those other bright white contemporaries that litter these hills. Guests wishing to gain access must enter through a front courtyard (more like a gated walkway, really) and step over a bubbling fountain to reach the inside. 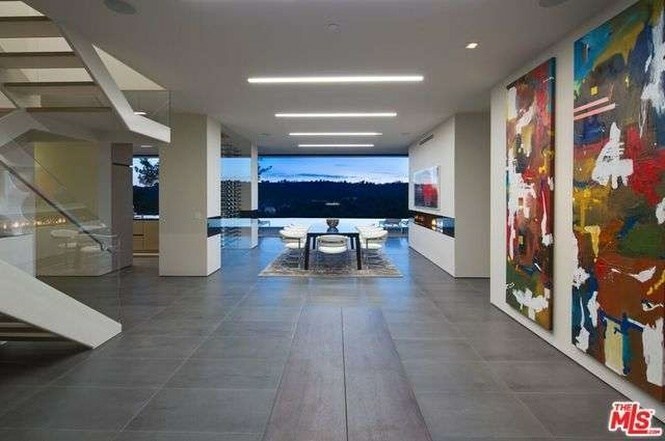 We’re not gonna lie, Yolanda was very impressed by the gallery-style entrance foyer that provides a straight-shot view past the formal dining table, throught the floor-to-ceiling glass walls, over the infinity-edged pool and to the thickly-wooded Benedict hills. The floors are black tile. Speaking of the dining table, it appears to be forged from either black marble or (more likely) an ebonized wood of some sort. Then there’s one of those nifty dual-sided fireplaces, on the opposite side of which is a clubby living room overlooking the mature pines out back. One fab thing about this house is that the view faces west, meaning those iconic California sunsets are a daily feature up here. As you’d expect, the kitchen is sleek, chic, and uber-contemporary. The center island looks bigger (or at least longer) than most Porsche 911s and the black-glass countertops look snazzy but are probably fingerprint hell — not to mention the glass wine cellar and super-expensive Miele appliances. Six bar stools adorn the table — perfect for Ms. Rosaldo, Mr. Derbez and his four kids Aislinn Derbez, Vadhir Derbez, José Eduardo Derbez, and Aitana Derbez to enjoy an informal meal together. Check out that black recessed shelf in the middle of the cabinetry. Kinda cool — we can’t remember seeing anything like that before. Whoops! Yolanda spoke too soon. Look what we got here! But it ain’t an overload, thankfully. The media room — or media nook — features a surround-sound system and a rather fratty-looking leather couch. No thanks on that piece! Although the 1.06-acre cul-de-sac lot may seem generous on paper, the reality is that a significant portion of that is hillside. But the developer still managed to squeeze in plenty of outdoor living space, like that dining table and lounge-y area and what appears to be an outdoor fireplace along the side of the main structure. Plus, you’re just 10 minutes by car from the Polo Lounge at the world-famous Beverly Hills Hotel. Yummy.